If you're looking to lose fat or to maintain a healthy shape, weight and lifestyle, chances are that you've looked into many different types of diets. One of the more balanced approaches is known as the Zone, which is a 40-30-30 meal plan. This diet emphasizes controlling the quantity of food you eat and the ratio of macronutrients, rather than banning or severely restricting certain foods or food groups. 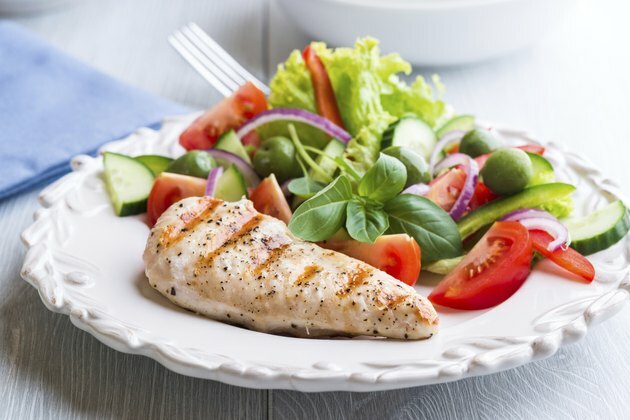 The Zone diet benefits are plentiful and include eating five times a day, balancing out meals, eating lean proteins and enjoying moderate exercise. The Zone diet was originally designed and popularized by Dr. Barry Sears in the mid-1990s. He theorized that this caloric balance keeps your body and mind working at its peak performance throughout your day. Your daily caloric intake will be around 1,200 if you're a woman, or 1,500 if you're a man. The 40-30-30 macronutrient ratio is the real defining factor of the diet. The 40-30-30 figure refers to the percentage of each macronutrient you should eat. Each meal should contain around 40 percent carbohydrates, 30 percent proteins and 30 percent fats. The 40-30-30 meal plans are more balanced than those that require you to completely cut out carbs, grains, dairy or meat. If you struggle to stick to diets that limit what foods you can eat, the Zone might be a good option. Additionally, the 40-30-30 macronutrient ratio with regular meals throughout the day has been found to stabilize blood sugar levels, which can keep you performing your best throughout the day. A 2010 study from the American Journal of Clinical Nutrition also found that nutrient deficiencies were far less likely on a Zone-style diet than they were on other popular weight loss diets. A study published in the British Medical Journal boasts great news about 40-30-30 meal plans for people diagnosed with pre-diabetes. Researchers recruited and randomly placed 24 pre-diabetic women and men to either the Zone diet or a high carbohydrate diet for six months to compare the results. At the end of the six-month study, 100 percent of study participants on a 40-30-30 meal plan had remission of their pre-diabetes. This study is the first high protein diet research to ever report a reduction of pre-diabetes symptoms and an improvement in metabolism and inflammation. Following a diet where you have to calculate out how much of each macronutrient you're consuming at every meal can be complicated and time-consuming, notes registered dietitian Juliette Kellow. When preparing food at home, you'll need to weigh everything. Eating out while calculating 40-30-30 macronutrient ratios can be difficult, so you'll have to guess at portion sizes. The official Zone Diet recommends counting food in blocks, which can get confusing too, adds Kellow. If you don't mind weighing your food before eating and you enjoy eating a wide variety of foods with little restriction, a 40-30-30 meal plan could be right for you. A sample day's breakfast could be a cup of cooked oatmeal with a tablespoon of walnuts, a small handful of blueberries and 1/2 a scoop of protein powder. Your lunch might be a small tuna and light-mayo sandwich accompanied by an apple. For dinner, you could enjoy a piece of baked cod with a 1/2 cup of black beans and a mixed salad with olive oil. Between meals, you can enjoy several snacks, such as a boiled egg and piece of fruit, a small dish of cottage cheese with pineapple and cashews, or 1 ounce of pre-cooked meat with vegetable sticks and hummus. How Many Calories Should I Eat at Lunch?